The first time Mason and I went to Paris, we took the train-ferry-train from London. I’d brought Hemingway’s A Moveable Feast to read on the trip, figuring, hey, I haven’t read any Hemingway. He’s American. He’s in Paris. Should be fun, right? I got as far as his report of meeting Gertrude Stein. He was disappointed that she was female because if she were male, he would have beaten her for being gay. As it was, he was just disgusted enough to immortalize the moment of shuddering bigotry in his memoir. I closed the book. As soon as possible upon our arrival in Paris, we went to Shakespeare & Co., so I could buy a copy of The Hunchback of Notre-Dame, since we were staying in an impossibly old hotel across the river from Notre-Dame. I didn’t know that I was in for a novel whose central theme was the exploration of bigotry. I was very young, okay? I was tempted to leave A Moveable Feast in Paris, but didn’t. I actually finished reading it on the plane home. 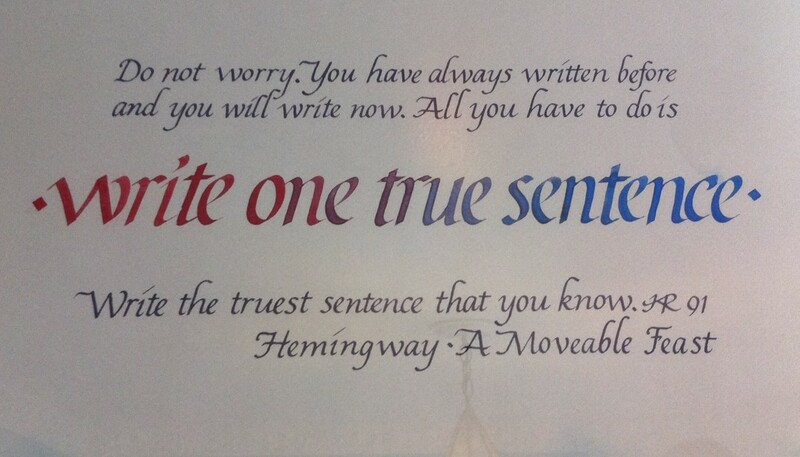 I’ve forgotten most of the book now, but part of what Hemingway had to say about writing made a huge impression. In fact, the quote hangs on my office wall. My intention at the time was that I’d heed the advice not to worry. Instead, Mom chose to emphasize, “write one true sentence.” The line is larger than all the others. It shades in color from crimson through purple to a rainbow of blues. The piece has hung in one office or another for over 20 years. It may be the best gift my mom has ever given me, the one that means the most. It tells me that my mom supports and encourages the work I do, even if the topics aren’t always things she wants to know I’d explored. It may also be the best advice about writing I’ve ever received. Words to live by. I guess it taught me that it’s possible to hate the prophet, but heed the prophecy. This entry was posted in Writing advice and tagged Hemingway, Moveable Feast, my mom, my office, one true sentence. Bookmark the permalink. An excellent quote for a writer and it seems to have served you well. I will have to pull out my old copy of “A Moveable Feast.” Good post!